Ubicom™ SX Family User's Manual. Programming the SX Microcontroller Text. Virtual Peripheral Methodology & Modules User Manual. Parallel Analog I/O Board with Adapter. Programming the SX Microcontroller Source Code Preview. Application Note - SX0001 75MHz Operation. Beginning Assembly Language for the SX Microcontroller. Ubicom™ SX Cross Assembler User's Manual. The SX Tech board provides a project development area for the SX microcontroller. Simply plug in the SX-Key, power, and build a project on the breadboard. The SX I/O ports and control lines are connected to the SIP headers on the side of the board for jumper wire access. 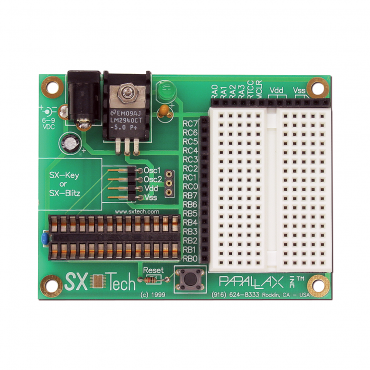 This board is ideal for use with Programming the SX Microcontroller and the Introduction to Assembly Language Programming Text. Plug in the SX-Key, a 6-9 VDC power supply, and build your prototype on the SX Tech Board. Low insertion force socket for the SX28AC/DP microcontroller. 3.25 x 2.5 x 0.65 in (83 x 64 x 17 mm). 32° to 185° F (0° to 85° C).